Firing off with a great view of the 9pm family fireworks exploding into showers of brilliant reds, yellows and greens over Sydney Harbour, Greg Poppleton and his 1920s Trio kicked off the countdown to 2019 at 12-Micron, Barangaroo with a high energy 1920s show where everyone partied. 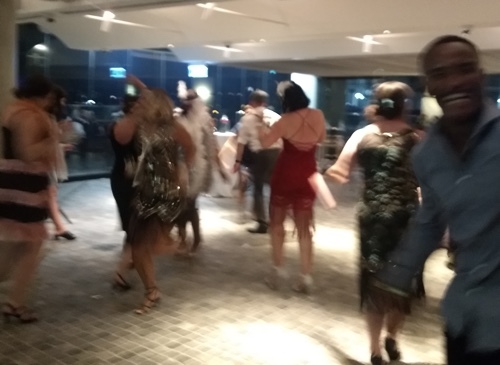 Guests dressed in speakeasy finery danced and partied to Greg Poppleton singing The Charleston, Peanut Vendor, Five Foot Two Eyes of Blue and a couple of 1930s requests for Jeepers Creepers and Cheek to Cheek. 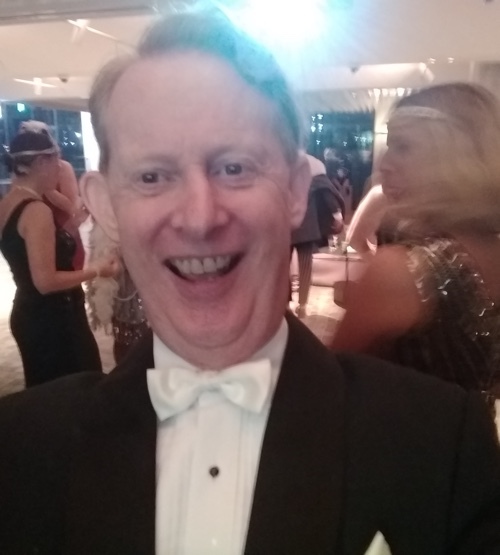 Greg Poppleton, Australia's only authentic 1920s singer bringing in New Years 2019 at 12-Micron, Barangaroo, Sydney Harbour. Greg pranced and danced in front of the band, crooned into his vintage 1920s microphone, and got up close and personal to guests, serenading them individually with his 1920s megaphone and big, warm lyric baritone voice. 12-Micron is a Barangaroo restaurant, bar and late night dessert house run by two-hat chef, Justin Wise. It's located on the Sydney Harbour waterfront at Shipwrights Walk. A real culinary gem in the car free laneways of exciting Barangaroo. In the band were Geoff Power on trumpet and sousaphone, who also played a Louis Armstrong request on 'Strutting with Some BBQ', Paul Baker banjo, and Ian Bloxsom, former Sydney Symphony Orchestra percussionist, on snare and washboard. Enquire about having Greg Poppleton for your party.